If you are annoyed by the flurry of useless and unwanted SMS, you receive on your Samsung smartphone. 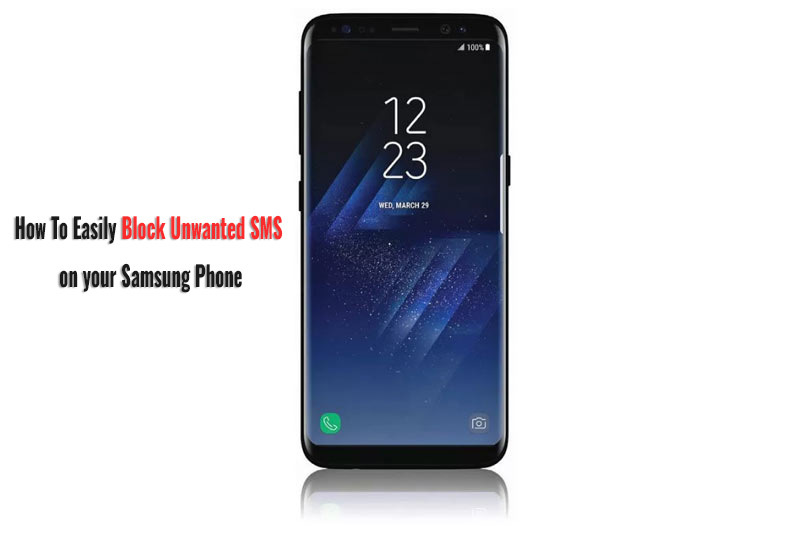 Here is a simple way to block them if you have a Samsung mobile running on the Android Nougat or the Android Oreo OS with Experience 9 UX. You don’t require any App or installation of any software. You can simply do it from the default messaging App on your Samsung phone. This method works with all the latest Samsung phones running Android Marshmallow or Android Nougat. However, the settings are a bit tricky to find, it took me 10 minutes to figure out. If you are not a tech-savvy, it could take you longer to figure out how to do it on your own. But here is a simple visual guide to help you get rid of nasty messages in a minute. Step 1 – You can Go To Default messaging App, and then click on the three dots you can see at the top right corner (as shown in the image below). On the Next screen, you will find the settings menu click on it. 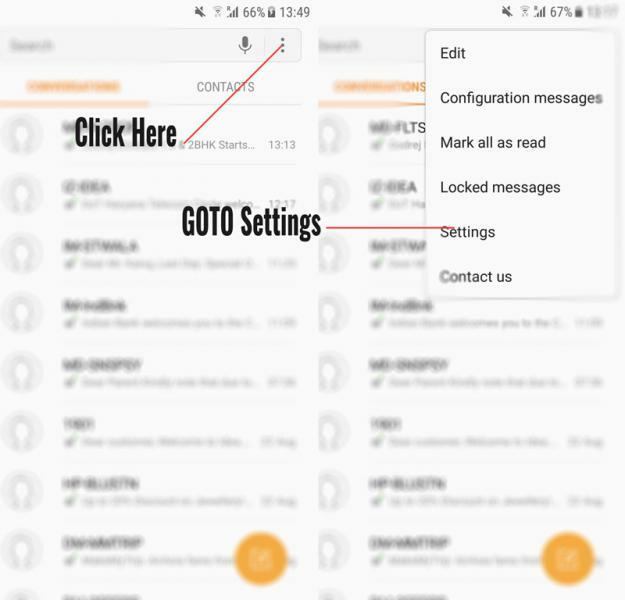 STEP 2 – Once you press settings in the messaging APP, you will see several settings options like Block messages, quick responses, and notifications. You can click on the block messages options (as shown in the image below). 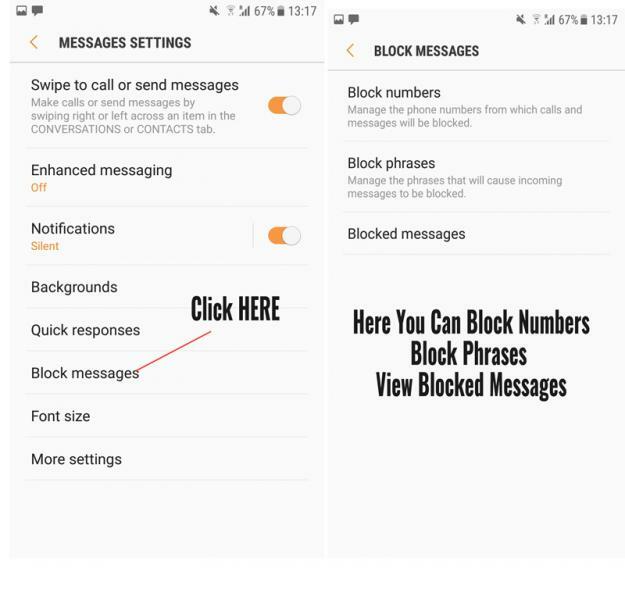 STEP 3 – On The further screen, you will see options to block numbers, block phrases, and blocked messages. STEP 4 – You can Click on Block Numbers and enter the number from which you are getting an SMS. 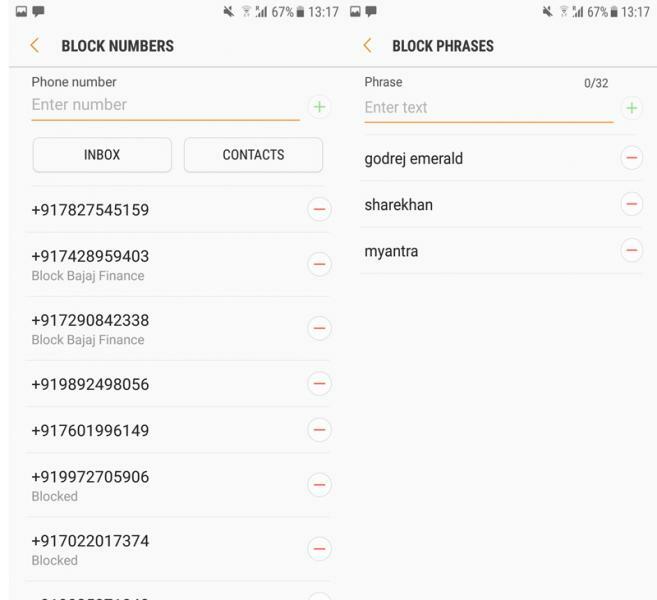 Besides, if you have the mobile number saved in your contact list, you can select and block it. Block Phrases – Sometimes the unwanted messages come from applications, and no number is displayed. In that case, you need to block the phrases in the messages. Like I keep getting messages from Myantra, or Godrej properties, or from Share khan brokerage. I have blocked these phrases (Myantra, Godrej and share khan) and now I don’t receive any messages from these. Also, one important thing doesn’t block too many phrases or common words because when you block a phrase all messages with that text will be blocked. Even from known contacts, so use the block phrases option wisely. Moreover, be selective and cautious to block phrases and words which you are sure are very specific. So that’s the easy way you can keep your phone distraction-free, and block the unwanted messages from useless marketing companies. Also, You may like to read How to increase the battery life of your smartphone or reduce the heating, can check out the articles.